Coming from an Irish family, the St. Paddy’s Day season is always an exciting time for me. A day filled with laughter, great grilled food, Irish Jig, and good beer! Life really doesn’t get much better than that. Today I’m going to cover how to grill Corned Beef for St. Patrick’s Day. I grew up with my mom cooking corned beef in a Crock-Pot, letting it sit all day, and enjoying at night. Since Weber is the center of all my holiday parties, I wanted to let my Weber bleed green with me on St. Paddy’s Day, so I tried something new this year and I was absolutely impressed! 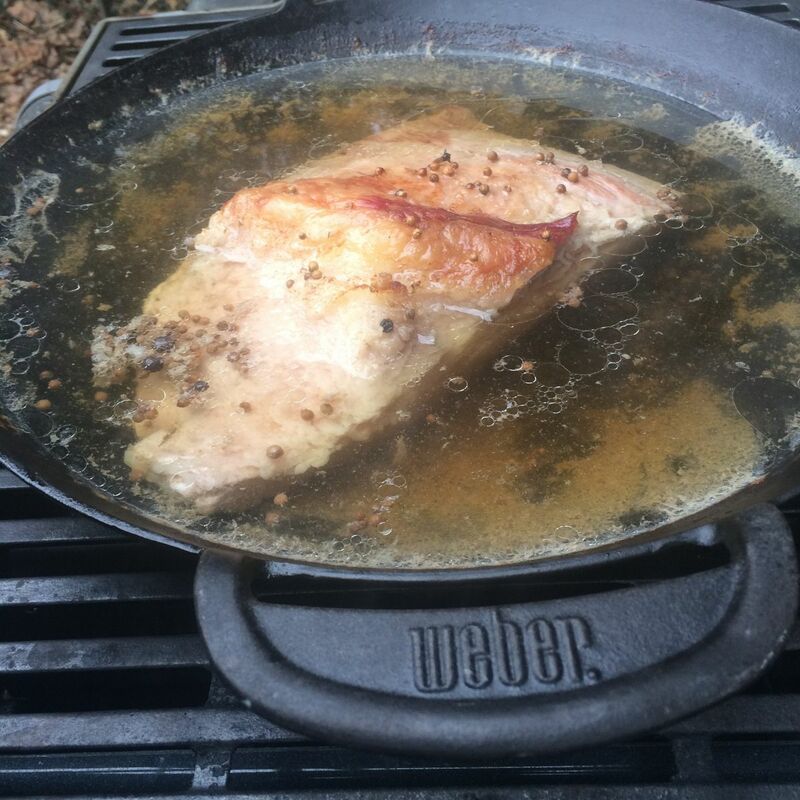 Corned Beef grilled in a Weber GBS Wok. If your unfamiliar with the term “GBS”, it stands for Gourmet Barbecue System. Weber’s Spirit, Genesis, and Summit gas grills have the GBS option, as well as a handful of Weber’s charcoal grills. Simply pull the center grate out and pick and choose inserts based on your grilling needs. It’s a way to take your kitchen to your backyard. The fun part is, you can play around with a variety of inserts and get 10 times better results then your oven, stove, or for this sake, your Crock-Pot...sorry mom! Gas or charcoal, if you have the right temperature and cooking time you will be very successful. Now let’s talk about the meat. I always recommend buying corned beef from your local butcher or store because it takes the extra time and hassle out of pickling the beef brisket. My local butcher pickles the brisket for me and includes a spice packet. Majority of your local stores should have this, especially around St. Patrick’s Day. If your corned beef doesn't come with a spice packet then get creative with whatever you prefer but some common spices are bay leaves, coriander seed, mustard seeds, caraway seed, white peppercorns, black pepper, cinnamon sticks, allspice, whole cloves and fennel seed. Or some people may prefer a similar approach of using a pickling spice, which kind of has all the spices in one. Now let’s go through the steps to grilling your corned beef. Step One: Preheat your grill on high for 15 minutes with the center grate insert of your GBS grate removed. Since the wok is made of a heavy cast-iron, I recommend waiting until the last five 5 minutes of the pre-heating process to insert it into the grill. The wok will get hot quick, and since we will be slowly grilling the beef at a lower temperature, we don’t need to pre-heat it for the entire 15 minutes. Step Two: Place your brisket in the center of the wok and add warm water until the brisket is almost submerged. Then add the spice packet to the water. A nice tip here is to make sure your grill is on level ground because you will be periodically be adding water to the wok throughout the grilling process and if the ground is not level you wont be able to add as much water, which means your beef won't be fully submerged. Step Three: After the water has started to simmer, about 5 minutes, you will turn off the middle burner and grill indirectly for the remainder of the time, leaving the two end burners on medium-low heat. You want your grill around 275 degrees F.
Step Four: After an hour of the grilling process, add one grilled sweet onion to the broth and a bottle of your preferred beer. This year I went with what was in the fridge—Spotted Cow from Wisconsin. Step Five: It is important to slowly flip the brisket each hour because the top will not be as submerged as the bottom, so make sure to have your timer set! I also recommend keeping an eye on the liquid level, because as it cooks, it will reduce and evaporate, so you will need to periodically add warm water to keep it as submerged as possible throughout the grilling process. Step Six: The corned beef will take about 2 hours per pound at 275 degrees F. Rule of thumb, you will know when it’s getting close to done when it’s soft to the touch and easily pulls apart. Step Seven: With about an hour left of the cooking process, I grill cut red potatoes, green cabbage, and carrots. Lightly coat the veggies with olive oil, salt, and pepper and grill for about 7 minutes, flipping once, at a medium direct heat of 400 degrees. After all the veggies have nice grill marks, I add them to the wok with the corned beef. Before you add them into the wok make sure to dump a majority of the leftover liquid, leaving just a little for the veggies to slowly simmer with the beef. The veggies will take around 30 minutes to fully cook. If your feeling really traditional you can even grill up some Irish Soda Bread and serve on the side. Note, if you only have one grill I recommend grilling the veggies first, before you put wok in the grill. Two last pointers I like to mention is that you want to make sure to grill this dish on a day where your planning on being home, since it is a longer grilling process and make sure to have plenty of fuel for your grill. And don’t forget to turn up your traditional Irish music or Celtic rock and get your Irish jig on in between flips on the grill!